Leaders – active and aspiring. Professionals working in leadership development. 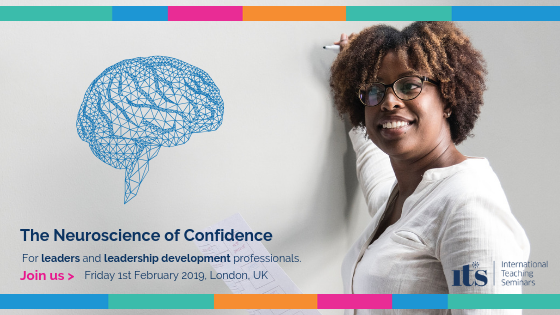 …Having an understanding of the ways in which our brain helps, hinders and assesses confidence will be important in developing these skills. Great leaders can be human – even humble – and they have a certain confidence: we trust them because they trust themselves. But how do you – or they – develop this confidence? Have you ever felt the job you’re in is too big for you? Or perhaps that one day “they” are going to find you out? What about finding yourself in an environment where all the skills and knowledge that have worked for you in the past are not quite getting the results for you now? Understand how to work with the networks in the brain that we use to determine trust in ourselves and others. Become aware of the differences in these networks and the consequences for our own behaviour. Learn how confidence is increased in the brain. Understand the beliefs that might be detrimental to confidence and learn how to change these. Practice tips and tools to improve levels of confidence. Open up the neuroscience of confidence. Provide practical how to’s derived from it. Provide tips and tools you can use immediately. BONUS OFFER: If you go on to book any Certified Programme with ITS in 2019, you will receive the full cost of this workshop discounted from the programme price. This also includes the option of paying via an interest free payment plan, and can be used in conjunction with any Early Bird Discounts in operation.